DENVER – October 5, 2015 –According to REcolorado, Colorado’s largest MLS and the provider of REcolorado.com, the housing market in the Denver metro and surrounding area continued its cooling trend in September. As inventory levels and prices remain steady, the market is seeing a slow shift to one that is more pleasing to the buyer. With 9,051 active listings on the market, September’s inventory of available homes for sale was down one percent month over month but, was two percent higher than this time last year. Inventory levels held steady thanks to sellers bringing 6,314 new listings to the market, nine percent less than last month but 18 percent more than September 2014. Inventory levels remained at 8 weeks in September, higher as compared to the summer months where we saw weeks of inventory as low as 5 weeks, but still well below the national average of approximately 12 weeks. After peaking at $374,890 in May, September brought a fourth consecutive month where average sold prices saw a slight decrease. The average sold price for a single family home in September was $353,197, down three percent from last month. Denver area home prices remain strong, up12 percent year over year. 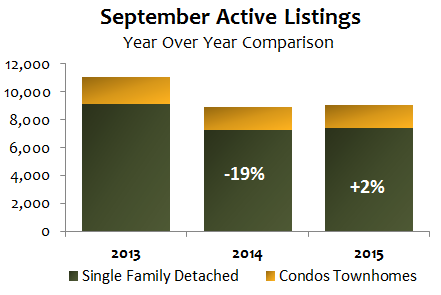 September also brought a seasonal downtick in the pace of home sales. Month over month, the sale of new homes was down 5 percent, and there was a six percent decrease year over year. The amount of time a Denver area home stayed on the market inched up once again in September. The average days on market was 24 days, a three day increase as compared to last month, but seven days less than last year. The housing market for the Denver metro and surrounding area has many similarities compared to last year, but compared to the third quarter just five years ago, it looks much different. Denver’s tight inventory levels continued throughout the third quarter of 2015. Compared to the third quarter of 2014, the number of available homes on the market shows little difference. However, a 2010 to 2015 comparison of third quarter inventory levels shows a 61 percent decrease in homes on the market. In 2010, there was 34 weeks of inventory, compared to just an average of eight during the third quarter of 2015. Home Sales during the third quarter of 2015 averaged 5,239 per month, which is 69 percent higher than the monthly average for the third quarter of 2010. At a monthly average of $360,828, the average sale price for the third quarter of 2015 is 35 percent higher than the monthly average of $266,467 seen in 2010. Compared to the third quarter of last year, the average home price increased 9 percent.